Home / #Chronicles / #Drugs / #TrueNews / Cocaine / Colombia / Pratica Radio / Radio / True News / U.N. / #TrueNews : Coca plant production reached record levels in 2017 in Colombia ! #TrueNews : Coca plant production reached record levels in 2017 in Colombia ! 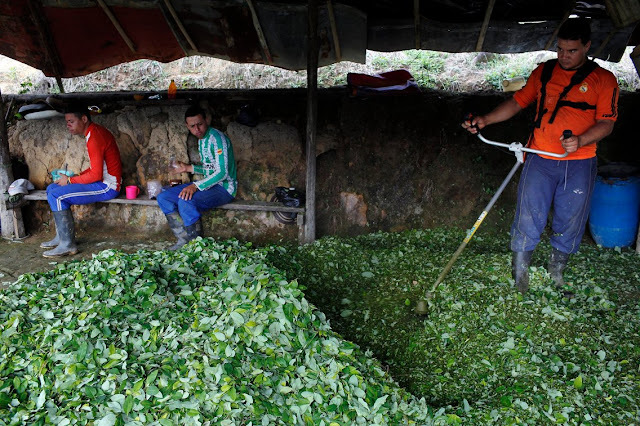 Colombia's coca plant production reached record levels in 2017. Production of coca, the plant used to make cocaine, rose to its highest level ever in 2017, despite billions of dollars spent by the U.S. government to eradicate it, according to a report from the United Nations Office on Drug Control. 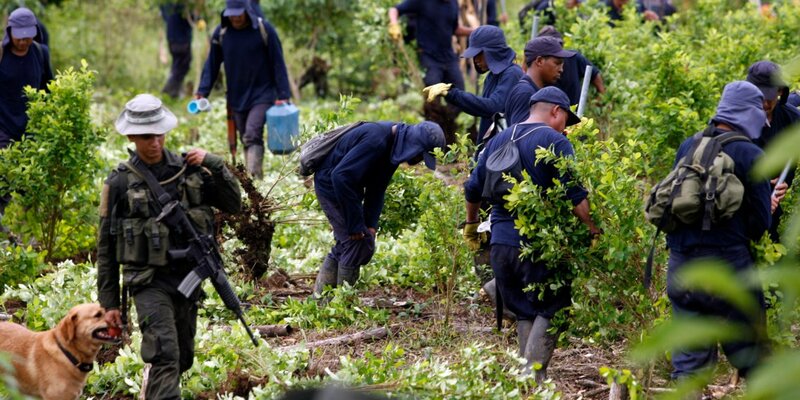 An Colombian antidrug policeman escorts workers during an eradication operation at a coca-leaf plantation near San Miguel, in southern Putumayo province, August 15 2012. Coca cultivation in Colombia rose again in 2017, though the increase was lower than past years. The US government also connected increased production to increased cocaine use in the US. Colombia's president-elect is expected to pursue more aggressive security and counter-drug policies. TUNE TO AMERICAN ROAD RADIO ! Production last year reached 171,000 hectares -- a 17 percent increase from 2016, the study found. Today, coca crops are producing 33 percent than in 2012. And despite U.S.-funded eradication efforts, 80 percent of coca is produced in the same area it was 10 years ago, according to the study. A Colombian farmer mulches coca leaves with a weed eater in the first step in making coca paste at a small makeshift lab in the mountain region of Antioquia, Colombia, January 6, 2016. According to the BBC, Colombian Justice Minister Gloria María Borrero Restrepo called the data "really very worrying." The U.S. government implemented Plan Colombia in 2000 to reduce coca production in the country through eradication efforts. More than $10 billion has been spent on Plan Colombia, but few positive results have been seen. Between 2000 and 2006, the amount of cocaine coming from Colombia into the United States increased, although heroin production was reduced by 50 percent, Foreign Policy reported. According to a White House report published in March, between 2007 and 2012, cocaine from Colombia decreased by about 50 percent, but has surged since then, reaching pre-2006 levels by 2015 and increasing by about 60 percent since then until surpassing pre-Plan Colombia began production levels.